I have been to a Five Guys Burgers and Fries restaurant once, last summer, and I've remembered that tasty burger. I loved that I got to choose exactly what I wanted on it-- tomato slices, lettuce, raw onion, cheese, ketchup and mustard. And I liked getting to watch them put it together efficiently but with care (no burgers half off the buns, tomato slices were prettily laid out, slightly overlapping), in plain sight according to my order. It felt like slightly classy fast food, if that's possible. I also liked that, like most fast-food burgers I guess, it was thin (you could choose a double decker or something, but I did not). I like them thin because a fat burger can be so filling, and I like to reserve some height for all those good accompaniments. Then I read this formula for making thin, fast-food-style burgers at home. I like finally having a clear recipe for how long to cook burgers. You cook the first side, flip, then add cheese and cook the second side-- for less time, at slightly less heat. It makes sense. 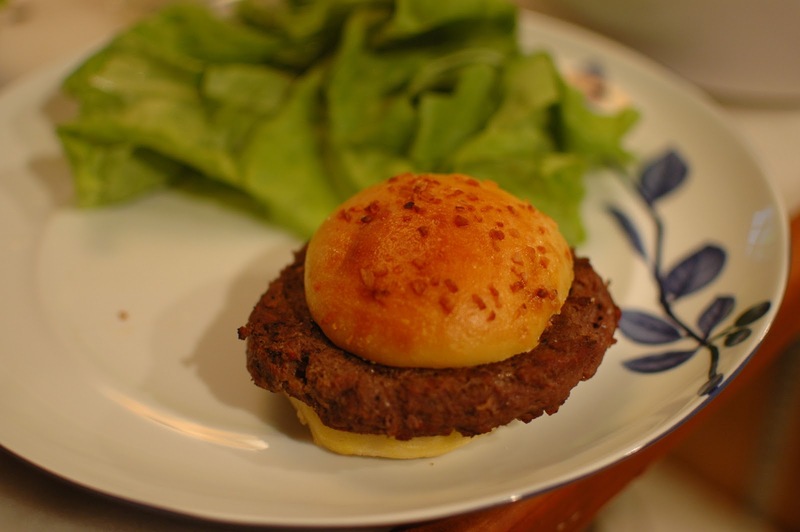 The cheese is perfectly melted and one with the meat, and it yields a perfectly cooked, juicy burger every time. We don't eat burgers much, but when we do, I'm sold on them made like this now. I like the beef we get and with these focaccia buns I've been finding (haven't managed to keep up the bun-making habit, I'm afraid), it's reminiscent of the McDonald's cheeseburger of my childhood, but better in every way. We like to serve burgers with french-fry-like roasted potatoes or other roasted veggies and/or salad. Makes four burgers. Stuffing his little face with his half a burger. Heat a griddle or two skillets over medium high. Cook patties, pressing with a spatula, 3 minutes. Reduce heat to medium, flip, and top with cheese. Cook 2 minutes. Toast cut sides of rolls on griddle until edges just start to brown, about 1 minute. Place burgers in rolls and serve with extras on the side for everyone to top as they like. The homemade buns impress me!